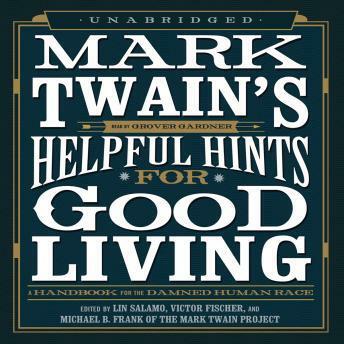 Irreverent, charming, and eminently quotable, this handbook-an eccentric etiquette guide for the human race-contains sixty-nine aphorisms, anecdotes, whimsical suggestions, maxims, and cautionary tales from Mark Twain's private and published writings. It dispenses advice and reflections on family life and public manners; opinions on topics such as dress, health, food, and childrearing and safety; and more specialized tips, such as those for dealing with annoying salesmen and burglars. Culled from Twain's personal letters, autobiographical writings, speeches, novels, and sketches, these pieces are delightfully fresh, witty, startlingly relevant, and bursting with Twain's characteristic ebullience for life. They also remind us exactly how Mark Twain came to be the most distinctive and well-known American literary voice in the world. These texts, some of them new or out of print for decades, have been selected and meticulously prepared by the editors at the Mark Twain Project.